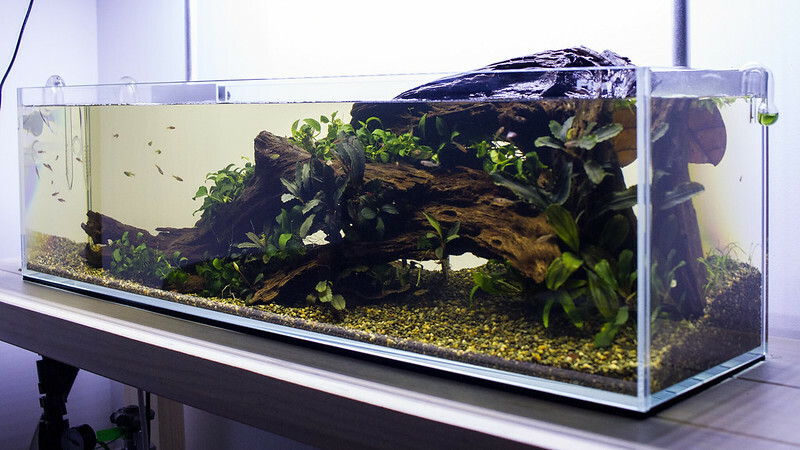 Took some more photos today, water has cleared up can see thru the tank length ways now, much less hazy, perhaps a bit more tinted. Last edited by doylecolmdoyle; 11-12-17 at 09:21 PM. I have some terrestrial Baby's Tears, you can get it at any nursery, that would grow great and look good on the top of that wood.. Thanks Merv that could be a good option, I think I have seen some baby tears at bunnings, unsure if I want to put anything on the wood, I do like the clean look, I was thinking terrestrial moss but no idea where to source. I also like the amount of plant you have around your structure. 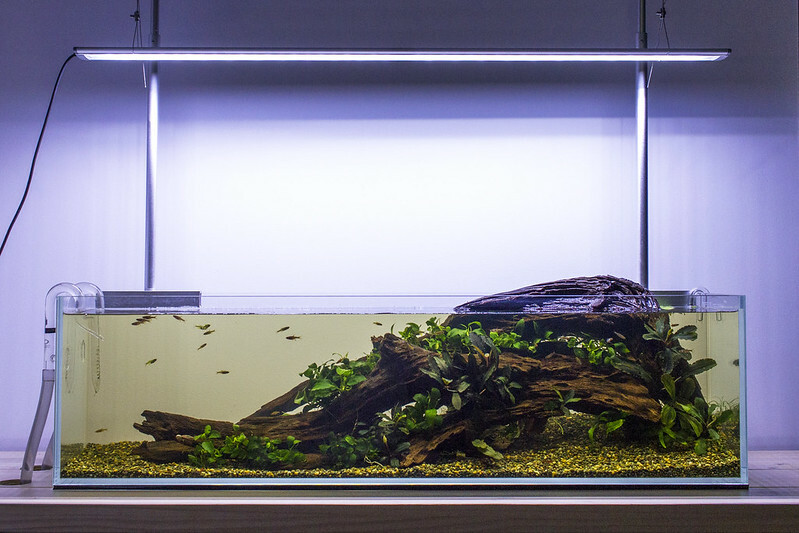 Agree with you about keeping the look clean, too many people let plants grow to the point where it is coverting the hardscape underneath..
my AAAAA tank is the same. most of the lava rocks are just balancing atop each other whilst holding back 10cm depth of aquasoil. i used some 'aqua knead it' on the overhanging rocks in the cove area to create shadows, but the whole thing is quite precarious. the big piece of wood too. are you gonna try and get the water reaaaally dark? 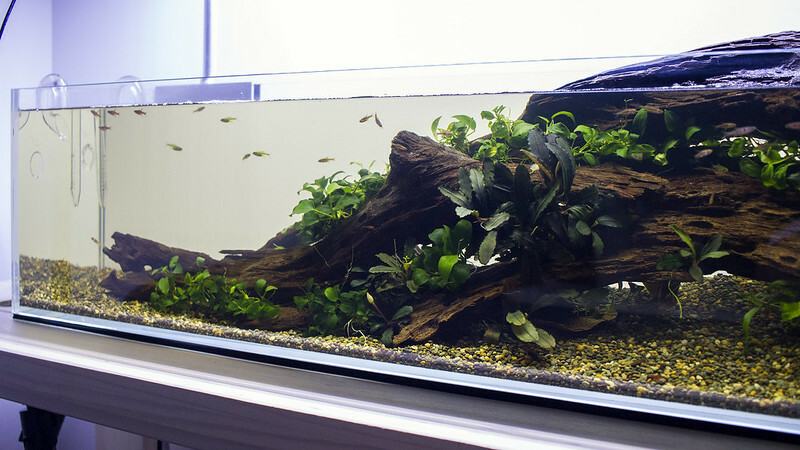 A tank can be clean and crystal clear but still be tinted dark. Would help if you could dial the light colour right down too. Definitely would look better reaaally black. Cheers guys, the photos are probably not a true representation of light levels, I played around with shadows setting in photoshop to bring out some of the dark details which in turn washes out the tint in the water, will have to post a realistic photo of the lighting levels. 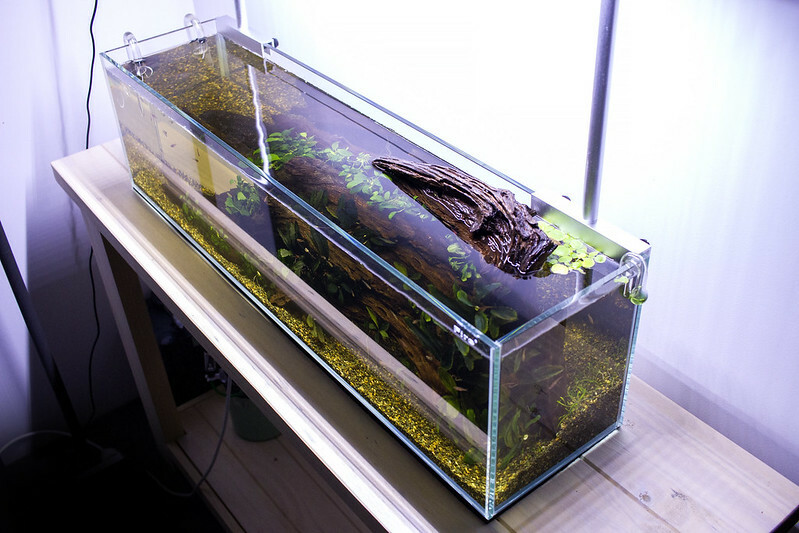 I have ordered some almond leave tea bags will add a few of those when they get there, at the movement I dont want to add to much "loose" leaf litter... tho things will probably change once the clean new scape syndrome wears off. I love the simplicity of the wood & plants & the flow of the wood. If you want it darker you might add a small piece of mallee root to your existing wood if you can get your hands on some. They leach tannen for quite a long time. I'm currently using mallee as drift wood in my scapes (sold at the local wood yard lucky for me). 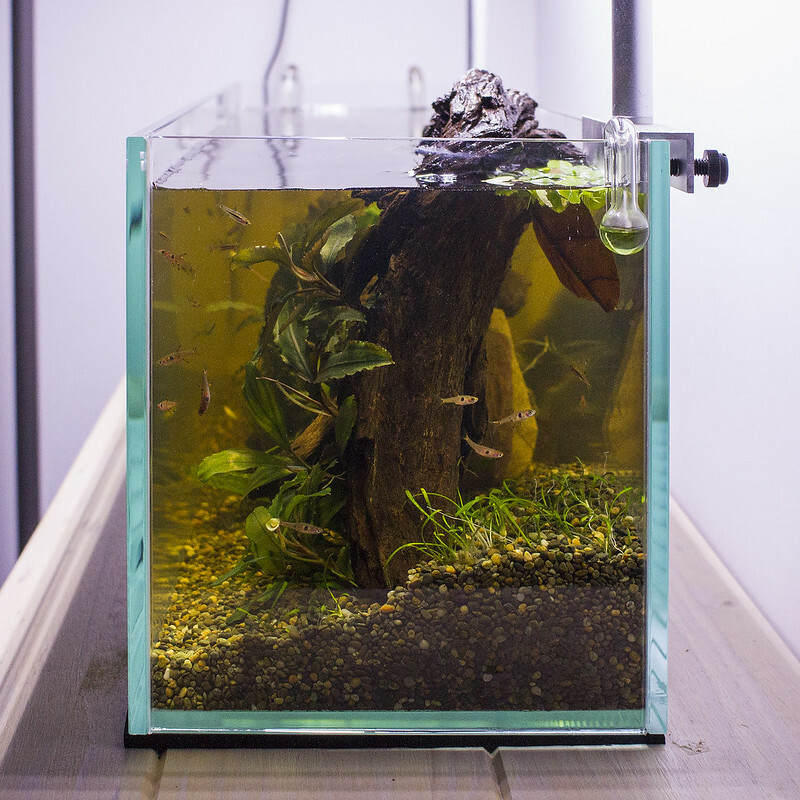 Despite soaking & boiling thoroughly prior to using it, even a small piece added to the tank colours the water. 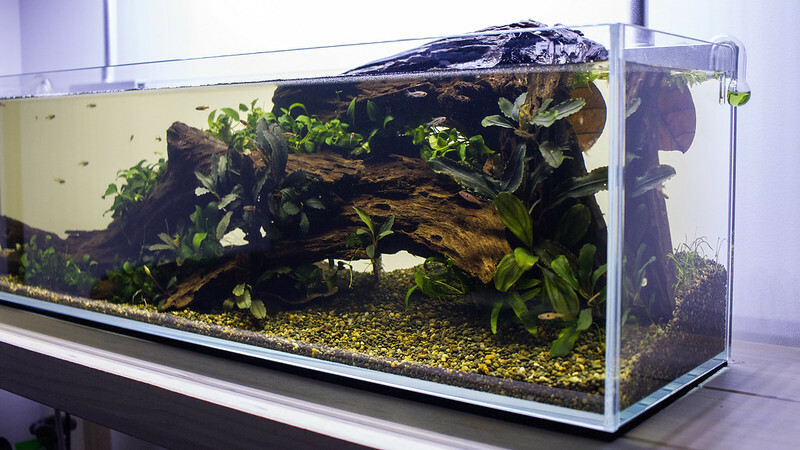 You could easily hide a small piece in your existing scape & it would be clean & easy to remove. Thanks I am kind of happy with the tint of the water, will keep adding a few almond leaves, added a bunch of small alder cones, I think its a bit darker, will post another photo tonight and make sure I dont over edit the photo to show the true lighting / darkness.